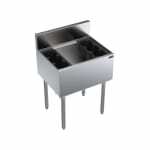 The Krowne KR18-24-10 underbar ice bin is designed to give bartenders and servers convenient access to ice for cocktails and other drinks. This model includes a 12-inch-deep ice bin capable of holding up to 80 pounds of ice and insulated with foamed-in-place polyurethane to keep that ice frozen longer. Six removable bottle wells, arranged in two sets of three and mounted on either side of the ice bin, will speed up the drink-making process by keeping popular flavors and syrups nearby. The cold plate on this underbar ice bin, which is sealed into the bottom of the unit, offers soda line access with 10 circuits. Designed to be used with post-mix soda, each circuit is made with stainless steel tubing that has a 5⁄16-inch OD. Tubing access is provided by a cutout measuring 3⁄4-inches by 31⁄2-inches, and the cold plate requires a 1⁄2-inch IPS drain connection. The Krowne KR18-24-10 jockey box comes standard with a 7-inch backsplash to prevent water and soda from splashing on the wall behind the unit and 15⁄8-inch tubular legs that provide a comfortable working height. Both of those features are constructed from stainless steel, while the rest of the unit is constructed with galvanized steel.